"When an armed and threatening power lands uninvited in our capitol, we don't meet him with tea and cookies!" UFO and alien paranoia films were big business in the late 1940s and on into the '50s, but few of those projects had the lasting impression of Earth vs. the Flying Saucers. Though history remembers the film primarily because of its amazing special effects by stop-motion guru Ray Harryhausen, the film itself isn't too bad either. This movie is so influential that it still effects recent cinema (Independence Day copied it and Mars Attacks satirized it). The concept of alien invaders battling against good ol' fashioned human intellect is now a permanent fixture and will be a source of inspiration for decades to come, no doubt; this is one of the quintessential entries of the genre. Dr. Russ Marvin (Hugh Marlowe) is a scientist working for a project designed to launch satellites into orbit around Earth that will help give information about space to all of the important people, but he soon discovers that all the rockets they've been sending up have disappeared. Marvin suspects something very unusual is behind the destruction of the satellites and thinks it might have something to do with the numerous UFO sightings in the area, as well as some strange lights appearing here and there. His assumption proves correct when a flying saucer attacks his research station and kills everyone there. In the aftermath, the U.S. military is still resisting the suggestion that aliens in flying saucers are the culprits; this all changes when Marvin contacts the alien beings, meets with them, and is delivered their terrible ultimatum: Prepare to be conquered peacefully in 56 days or be conquered by force. So, mankind is faced with only one realistic option, to fight off the invaders however possible. Though their technology seems invincible, Marvin works on a possible plan to counter it. What results is a slightly stiff but effective thriller in which all the threads come together quite well. To begin with, the script is briskly paced. Most sci-fi films from the 1950s tend to oversell some kind of monster for the entire movie, ending with a disappointing climax. Here, though, the alien presence is there from the beginning and there's very little setup. The first special effects sequence is barely 5 minutes into the film. 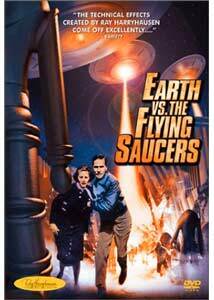 Because there are no pauses for lengthy dialogue, Earth vs. the Flying Saucers is packed with pure story and action. Ray Harryhausen's stop-motion flying saucers and general production design is at the pinnacle of effects work for the time, despite serious budget limitations. One of the most impressive sequences involves a flying saucer starting a forest fire with its deadly ray while pursuing Dr. Marvin. Harryhausen actually lit the saucer with flickering gels so that it matched up perfectly to the rear-projected shots. Of course, the most famous moments here involve the exciting finalé in which the saucers attack Washington D.C., and destroy many important landmarks in the process. As a testament to the effective use of technical skill, many of the shots include amazing destructions of buildings that had to be animated by hand, brick-by-brick. I'll admit, without its effects, Earth vs. the Flying Saucers might not be quite as memorable as it now is, but it is a very well made sci-fi picture, great effects aside. It shakes off many of the typical clichés of the genre from that time and delivers a very busy film that never really slows down. Though tame by modern standards, the film is truly one of the most intense and visceral ones of its day that never bothers to overexplain the alien motivations. It portrays a mysterious horror from the depths of space and is content to leave it at that, which adds a rather chilling aspect to its non-committal ending; another break with '50s tradition. Image Transfer Review: The black & white transfer is very pleasing, and that might be an understatement. Columbia seems to have obtained an amazingly clean copy of the film with which to make this wonderful, fine-grained anamorphic transfer. Very little harsh grain means there's only passing, minor artifacts in backgrounds and dark textures, and the level of detail is definitely high. While some scenes suffer a bit where stock footage was used, all of the original material is restored amazingly well and I think I can say this is the best Earth vs... has looked probably, ever. Audio Transfer Review: The soundtrack is a 2-channel mono experience and it sounds quite good, given the problems normally associated with old mono tracks. Sound work in the film is another high point, with many advanced techniques used to create various sound effects, so it's a good thing the track is so nicely brought out. There are no distortions and the frequency response seems quite "roomy," allowing the track some space to move in without collapsing the low-end effects. Extras Review: So far, Columbia has had a good track record with supplements for their Ray Harryhausen Collection, and this is no exception. Another in the long series of interview featurettes is presented, this one focused on the feature at hand. As with the featurettes on other Harryhausen discs, the interviewer is director Joe Dante. The discussion is quite pleasant; Harryhausen himself actually handles some original props from the effects design of the film. While other discs in the collection have had fragmented pieces of the longer documentary The Harryhausen Chronicles, here the entire one-hour documentary is presented. Narrated by Leonard Nimoy, this provides an excellent look at the effects master's life and career. The ultimate treat is the appearance of original props, such as Pegasus from Clash of the Titans, the battling skeletons from Jason and the Argonauts, and the giant saber-toothed tiger from Sinbad and the Eye of the Tiger. The final featurette is the original This is Dynamation short from the 1960s, which premiered in theaters to promote The 7th Voyage of Sinbad. There is a photo gallery of both promotional and behind-the-scenes material, which is presented nicely for the film enthusiast. Some trailers for other Harryhausen projects finish things off. While the cover art is entirely redesigned for the DVD release, the keepcase insert contains a nice bit of artwork, styled on the original promotional work. A pleasing edition, Earth vs. the Flying Saucers is simply a must-see for any budding film buff or even hardened movie-goer. It stands out as one of the most effective and best of classic sci-fi movies, and marks another feather in the cap of master fantasy film craftsmen Ray Harryhausen and producer Charles H. Schneer. While so many projects from this period come off as campy or terribly unenthusiastic, this endures as a true American classic.